Mission: Ensure that state and local homeland security plans on terrorism and disaster preparedness are executed and coordinated efficiently. Function: The Council shall continue to create, develop, and provide oversight to specific homeland security working groups and to dissolve such working groups when their missions are accomplished. 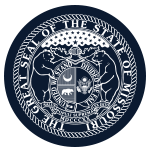 The Council also shall continue to work with and provide direction to regional homeland security oversight committees and establish strategies and priorities for Missouri homeland security grant funding programs and initiatives. Term length: Serve at the pleasure of the Governor. The Governor at his discretion may appoint ex-officio members to the Council. Member Requirements: The Director of the Department of Public Safety shall serve as the Chair of the Council. The Director of the Office of Homeland Security shall serve as the Vice-Chair of the Council. Other members of the Council shall include: the Director of the Department of Public Safety (or his or her designee); the Director of the Department of Agriculture (or his or her designee); the Director of the Department of Corrections (or his or her designee); the Director of the Department of Economic Development (or his or her designee); the Commissioner of Education (or his or her designee); the Commissioner of Higher Education (or his or her designee); the Director of the Department of Health and Senior Services (or his or her designee); the Director of the Department of Mental Health (or his or her designee); the Director of the Department of Social Services (or his or her designee); the Director of the Department of Natural Resources (or his or her designee); the Chief Information Officer of the State of Missouri (or his or her designee); the Director of the Department of Transportation (or his or her designee); the Chairman of the Public Service Commission (or his or her designee); the Director of the State Emergency Management Agency (or his or her designee); the Adjutant General of the Missouri National Guard (or his or her designee); the Colonel of the Missouri State Highway Patrol (or his or her designee); the State Fire Marshal (or his or her designee); and the Director of the Missouri Interoperability Center (or his or her designee). The Director, Chair, Chief Executive Officer, or President (or their designee) of the following vital stakeholders to Missouri's homeland security efforts may also be voting members: the Missouri Red Cross; the Regional Homeland Security Oversight Committee Chairs; all Metropolitan Statistical Areas in Missouri included in Department of Homeland Security risk validation processes; all Intelligence Fusion Centers operating in Missouri; the Missouri Emergency Medical Services Association; the Missouri Association of Fire Chiefs; the Missouri Police Chiefs' Association; the Missouri Sheriffs' Association; the Missouri Emergency Management Association; the 911 Service Board; the Fraternal Order of Police; the Missouri Voluntary Organizations Active in Disaster; the Missouri State Council of Fire Fighters; and other members or agencies appointed by the Governor.